You may have noticed the link in my side bar to Kirly in NZ. I went on a Lord of the Rings Movie Location Tour with Red Carpet Tours. It was the vacation of a lifetime. I made friends there and because of my trip, have made other friends with connections to NZ. I hope to go back some day. The Kiwi people were universally pleasant and friendly (like Texans!). Christchurch was one of my favorite stops on the tour. I was saddened to hear of the death and destruction which has taken place there. Pray for the Kiwis. And remember that they and Australia have been among our best friends. Rose found a link to live streaming local television coverage here. I stayed up way too late watching that last night. 65 reported dead last I heard. From the looks of the devastation, that number will likely go up as more people are found over the next days. The damage is much worse than last September. 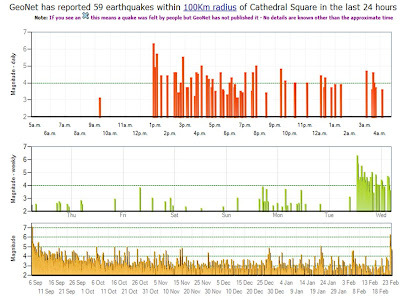 Look at this graph from GeoNet which is reporting 59 quakes. 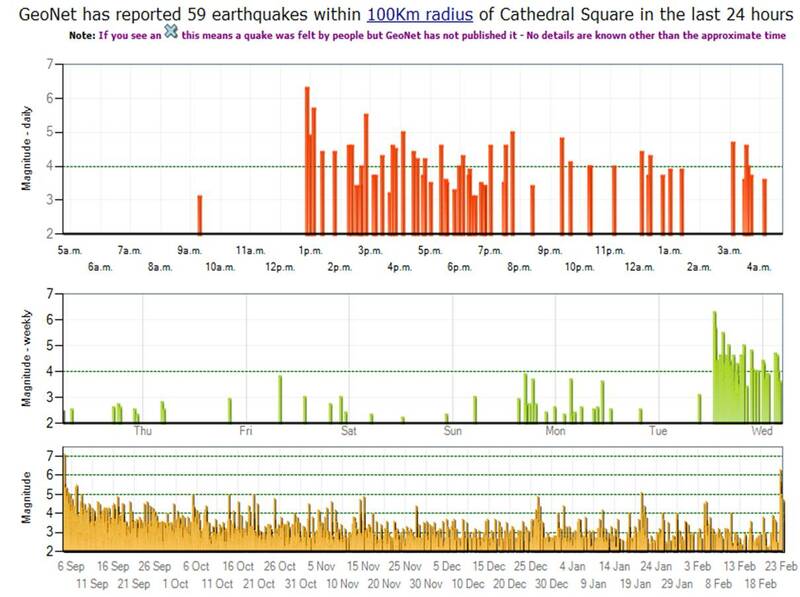 Some of those after-shocks rival the big jolt at the beginnning. Pray for New Zealand! Remember the ANZAC spirit! What Would You Do hires an actor to play a racist cop demanding to see identification from fake illegal aliens in Arizona.